Normally, running wide open toward a bunch of herons and egrets standing ankle-deep qualifies you as certifiably insane. But for every rule, exceptions exist. Capt. Greg DeVault had no intention of harming the birds - they fuss about the intrusion, but they move when you get too close anyway. DeVault just needed to reach the bay on the other side of this expansive flat and running the outside route would have burned a lot of valuable fishing time. Now that logic train makes no sense for even the tiniest of stripped down, puckered-up, shallow-draft tunnel hull skiffs. I mean, you could have dropped a golf ball on this flat and half of it would have remained dry. Line up most inshore boats for this run and you're looking at a guaranteed grounding. Try it in an airboat and the worst you'll do is irritate a bunch of crabs that duck and curse as the magic carpet of coastal fishing slides overhead. Hailing from Port Richey, DeVault drives an 18-foot Freedom Craft powered by a 500-cubic inch Cadillac engine with a 2-blade carbon fiber prop. From late November through February, he spends a lot of time pursuing redfish, trout and snook throughout the backwater shallows of Charlotte Harbor. An accomplished tournament angler on the Redfish Cup and FLW Redfish Series circuits, DeVault runs a Ranger bay boat or a Ranger Banshee, depending on where he's fishing. So, why the dramatic departure to a big breeze machine? In a word: access. With nearly limitless potential, airboats can go on low tide where outboard-powered vessels can't reach on the flood. Kayakers enjoy similar advantages, but when speed and range matter as much as draft, airboats win hands-down. "There's so much great area in here, it's a shame to fish just one spot, when you can fish all of it," DeVault said. 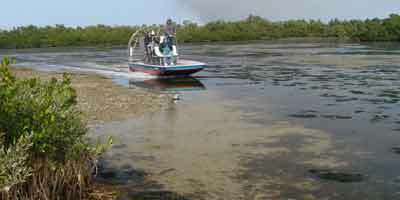 A growing number of inshore guides have discovered how the airboat's abilities make the most of shallow water operation. That's especially true when winter's extreme low tides trap gamefish in the deep holes between mangrove shorelines and the outer perimeter of sandbars and grassy ridges. In this scenario, catching fish is the easy part. Getting to them is the tough task. Wading offers a viable option, but you're limited in the amount of ground you can cover. And when the honey holes lay far beyond the reach of outboards, a long hike doubles in distance when it's time to return to your anchored vessel. Not so with airboats. Superlatives are easily clichéd, but this is about as close to infinite, as you'll get. Over shallow grass beds, through narrow mangrove creeks and right along the edges of treacherous shells - you'd be hard pressed to find a coastal habitat that puts the brakes on the big fan. "You can run just about anywhere in an airboat, but you wouldn't want to run right over an oyster bar because that would damage the structure by (dislodging the shells)," DeVault said. Other than that, airboats are environmentally-friendly. With nothing dragging below the hull, they bear no negative impact on the sensitive sea grass habitat that anglers treasure. This point stood abundantly clear as DeVault and his crew fished a series of potholes on the edge of a flat that was horribly disfigured by multiple prop scars. When we left, DeVault ran right over these tragic marks but added nothing to the collection. From a functional standpoint, you'll give up the 360-degree fishability common to most inshore skiffs, but airboats usually offer a broad, rectangular front deck, so 2-3 anglers can work side-by-side (assuming a reasonable level of experience and skill). The design of airboat seating provides a strategic vantage point, as the elevated perch offers a good scouting perspective. In some ways, the airboat's quasi tower ranks superior to that of traditional "towerboats." For one thing, most airboats have 2-tiered bench seats, so captain and anglers can simultaneously fish aloft or scan the area for targets. Also, with a towerboat, you have to be idling or on plane to run through shallow water. Not so with an airboat; go as slowly as you please and scout an area thoroughly. DeVault said this scooting ability comes in handy when prospecting the countless potholes of Charlotte Harbor. "I can ease right up the edge of a hole without disturbing the fish. When it's time to move on, I can slide over to the next hole." Airboats have a few drawbacks. Most have less hatch space than flats or bay boats and the gunwales are a little higher, so you'll reach farther to lift and release fish. Also, loose items are easily sucked into the propeller. It takes a pretty big object to jam the fan, but hats, jackets, and granola bars will be shredded if they tumble aft while running. Now, naysayers claim that airboats scare all the fish out of the areas in which they run, but such claims hinge more on emotion than fact. Granted, anything that zips over the spots where fish nap will likely send them scurrying. But consider this: Airboats keep the majority of their noise above the surface, so fish probably hear less than they do from passing outboards. Nevertheless, be courteous to other boaters to avoid prop washing. Anyone within 50 yards of the prop is going to get wet and the breeze is more than they'll want to endure - especially on a cold day. Good thing about airboats is that they're very good at getting away from crowds - just as long as that doesn't involve crossing major channels. These vessels will have you death-gripping your seat in choppy water where swamping is a serious concern. If you had to cross a body of deep water, pick your conditions prudently. Of course, if you choose the right day, and plan your launch site accordingly, you'll have no need for challenging channels. You'll be too busy looking at fish. For airboat charters, contact Capt. Greg DeVault at (727) 919-8666.